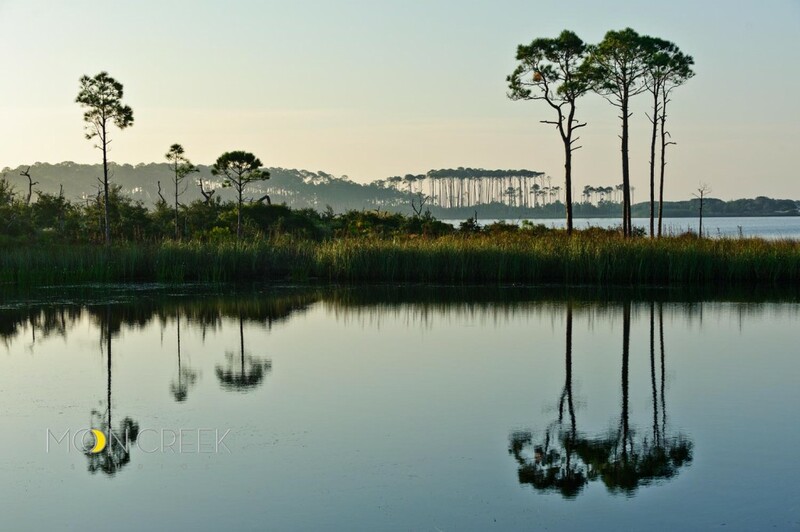 Grayton Beach State Park is one of the the most popular parks in Florida, with massive dunes, winding trails, abundant wildlife, and shimmering Western Lake, one of many coastal dune lakes gracing Scenic Highway 30A along South Walton Beaches. Grayton Beach State Park is located on Scenic 30A, south of US 98 approximately halfway between Panama City Beach and Destin. Take county road 283 south of US 98, turn left at the stop sign on 30A (approximately 1/2 mile east of the intersection of Scenic 30A and county road 283). Lay out on our sugar sand beaches or swim in the emerald green water of the Gulf of Mexico and enjoy one of the most beautiful beaches in the world. Also be sure to enjoy a Grayton Beach sunset. Read Dr. Beach’s report about Grayton Beach – America’s Best Beach. Grayton Beach was named a Top Ten Beach again in 2016 by Dr. Beach with all-new criteria – read the report. Bring your bike or your favorite hiking shoes to Grayton Beach and enjoy a four mile off road trail through acres of natural communities or hop on Walton County’s 10 mile walking, biking path along Scenic Hwy 30A which winds along the coastline through our picturesque beachside communities. A boat ramp is available on Western Lake. Canoe rentals are available. If the tent or RV lifestyle is not for you, try out our duplex cabin area. The cabins are nestled in the pine woods but are only minutes away from the waters of the Gulf of Mexico. Cabins accommodate six (6) people. Grayton Beach State Park offers 30 two bedroom, one bath duplex cabins. Each cabin is equipped with a gas fireplace (available for use November through March), central heating and air conditioning, kitchen with all your basic cooking and dining needs, screened in porch and outdoor grill. Linens, pillows, blankets and towels are also provided. You will need to bring personal use items such as coffee, coffee filters, soap, shampoo, paper towels, etc. (Linen is not furnished on a daily basis). In most cabins, the front bedroom has a queen bed and the back bedroom has two twin beds. Sorry, pets are not allowed. Two vehicles per cabin are permitted. Televisions and phones are not provide in the cabins. Grayton Beach State Park also has two ADA cabins for our special needs guests. Reservations may be made up to 11 months in advance by calling Reserve America, toll free, at 1-800-326-3521 (8:00 a.m. to 8:00 p.m. EST), 1-888-433-0287 (TDD) (For Hearing Disabled). Bring your canoe or kayak and explore the backwaters of Western Lake a 100 acre lake surrounded by the natural areas of the State Park. Saltwater species are caught in the surf, while both fresh and saltwater fish are caught in the lake’s brackish water. Do you need a Fishing License? 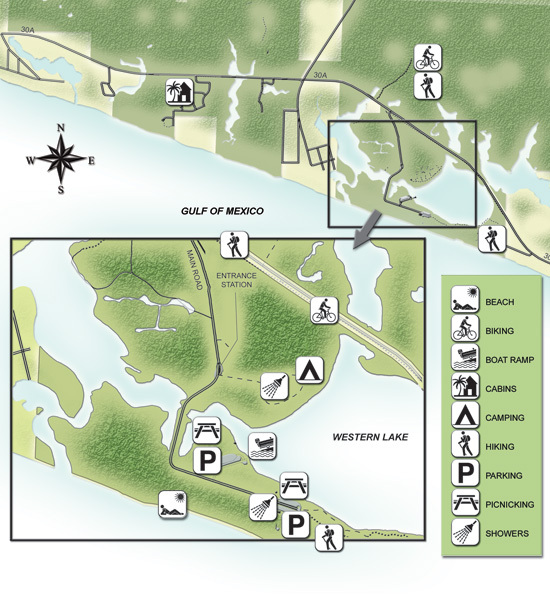 Grayton Beach State Park campground is one of the nicest camping areas along the Gulf Coast. The trees and shrubs between the sites let you imagine you are miles from civilization but with water, electric and a restroom with hot showers – roughing it is never too tough. Bring your RV or tent and come enjoy a great camping experience. Pets must be confined, leashed (not to exceed six feet in length) or otherwise under the physical control of a person at all times. Tethered pets must not be left unattended for more than 30 minutes. Quiet hours must be observed from 11:00 p.m. – 8:00 a.m. Pet owners must pick up after their pets and properly dispose of all pet droppings in trash receptacles. Florida law requires that pets be vaccinated against rabies. Any pet that is noisy, dangerous, intimidating or destructive will not be allowed to remain in the park. Non-furbearing pets, such as reptiles, birds, or fish must be confined or under the physical control of the owner. Some animals may be prohibited on park property. Failure to abide by these rules may result in the camper being asked to board the pet outside the park or to leave the campground. Large, covered picnic pavilions overlooking the Gulf and the lake is available. Swimming along the park’s one mile of shoreline is very popular. No lifeguards on site. The Grayton Beach Nature Trail begins near the beach parking area and winds among sand dunes, pine flatwoods and scrub communities. It is interpreted by a self-guiding leaflet available at the ranger station. There are many nearby trails north of the park in the Point Washington State Forest.